Two weeks after the biggest Israeli air strike in Syria since the Yom Kippur War, Israeli Air Force head General Amikam Norkin revealed that Israel used new F-35 planes in those attacks – the first time the advanced fighter jet has been used in combat by any army. The planes were used in several of the bombing attacks that targeted Iranian military installations in Syria. Norkin made the comments Tuesday at a conference attended by top brass of air forces from over 70 countries around the world. The conference is being held in Yerushalayim to celebrate the 70th anniversary of the state, and of the Israel Air Force. Norkin also said that in the operation – dubbed “House of Cards” – Syrian and Iranian forces fired more than 100 ground to air missiles at Israeli planes. In addition, 32 missiles were fired at targets in the Golan. None of the missiles hit any of the planes, and most of the rockets fired at the Golan fell in open areas, or on the Syrian side of the border. Iron Dome missile defense rockets knocked out four of the incoming missiles that were threatening a settled area. Israeli forces hit over 50 Iranian targets in that attack on May 10th. 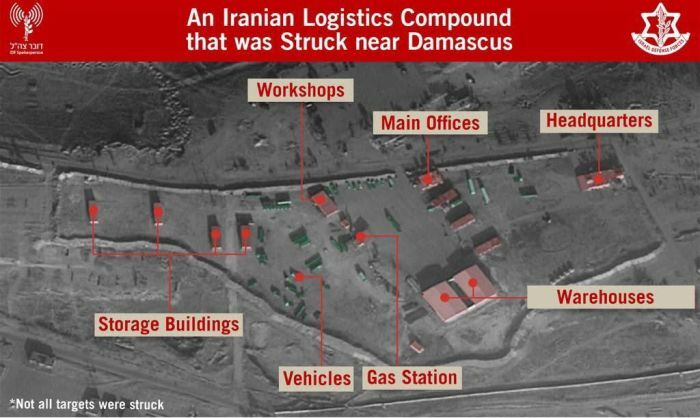 Sources told Hadashot News that Iran might have more installations in Syria, but that the purpose of the attack was to show Tehran that it had no possibility of fighting Israeli forces successfully under current circumstances. The sources said that it appeared that this round of confrontation between Israel and Iran was over – it appears unlikely that Iran will attempt to directly attack Israel in the near future – but that tension was still very high, and that Iran was still seeking its “revenge,” which it most likely would try to take via terror attacks against Israelis or Jews around the world.